CMI is here to help your business grow, together increasing the number and standard of professionally qualified managers. As the professional home of managers and leaders and the only Chartered Awarding Organisation of Management and Leadership qualifications we offer you a respected and recognised brand and portfolio of high quality internationally recognised, research led, future ready qualifications, programmes and endorsement. Our partnership approach and renowned customer care means we are here to support you and your learners with a comprehensive range of value adding and support services that make it easy to do business with us and enhance your credibility in the market place. We work with hundreds of education and training providers and recognise that your needs require flexibility from your Awarding Organisation. 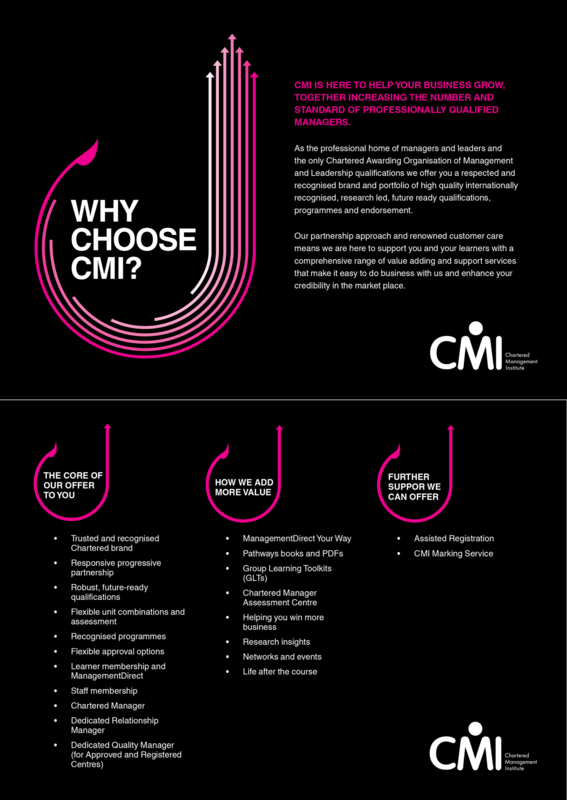 You can partner with CMI in a number of ways varying from simple recognition of your bespoke training programmes through to full approval to deliver and assess CMI qualifications. Work in partnership with the only Chartered Awarding Organisation for leadership and management to deliver and assess high quality, flexible, cost-effective qualifications. You’ll also gain access to our extensive range of unique services to enhance the experience you offer to your learners. Work in partnership with the only Chartered Awarding Organisation for leadership and management to deliver high quality, flexible, cost-effective qualifications. Free yourself up to focus on the delivery and we’ll undertake the assessment for you. You’ll also gain access to our extensive range of unique services to enhance the experience you offer to your learners. Stand out from the competition with CMI recognition of your bespoke training programmes. CMI recognition and certification enhances credibility and offers additional benefits for your learners and employer customers. To find out if becoming a Recognised Programme Partner is right for your organisation, contact us via telephone on +44 (0)1536 207334 or via our enquiry form. The infographic below illustrates how we work and our offer to our partners. Today the world puts huge emphasis on performance and demands more skills than ever before. Yet far too many managers don’t get the guidance they need to tackle their challenging roles. We want to end this paradox and help managers to stop simply getting by... and to start excelling. Our practical qualifications are ideal for managers and leaders at any level, and we remain the only Awarding Body able to award Chartered Manager status - the ultimate management accolade. But whatever qualification you choose all of them will be highly valued by employers, and boost your career prospects. CMI enjoys an authoritative mandate from the management community. So you can be sure that we can make your voice heard in government, education and business. When we speak, people listen. CMI offers you a comprehensive suite of management and leadership qualifications from level 2 to 8 (up to SCQF level 11) internationally recognised for their quality and excellence giving you flexible ways of enhancing the value you offer to employers and learners. Alternatively click the link below to request a call back and note your enquiry. Stand out from the competition with CMI recognition of your bespoke training programmes. CMI recognition and certification enhances credibility and offers additional benefits for your learners and employer customers. As an enabling partner CMI is committed to helping you win more business. Over and above our products and services that are designed to help you enhance credibility, aid differentiation and enable efficiencies we also provide you with a compelling, customisable promotional suite designed to help you to open doors and secure new business. Renowned for offering outstanding service, CMI works in partnership with you offering a dedicated personal service to ensure we understand the dynamics of your organisation and proactively work to deliver the right solutions for you.